.NET Reflector 10 is a major upgrade from .NET Reflector 9. If your current license includes a valid support and upgrades package for .NET Reflector 10, the same license serial number will automatically activate .NET Reflector 10. If your v9.x license does not include support and upgrades, Reflector will upgrade to a 14-day trial of v10.0. The issue with the Visual Studio gallery has now been fixed so the Vsix can be downloaded as normal through Extensions and Updates. So, a paid upgrade is required. Where can I read about the conditions? Not really sure exactly what you mean by conditions (unless you mean our EULA https://www.red-gate.com/assets/purchase/assets/license.pdf? ), and as far as I'm aware if your contract already covers it you won't need to pay, but I'm not the best placed to answer that. I'd contact [email protected] directly and ask the question there. But if I want to use the old 9 version, where do I get it? As your Page isn't listing anymore and the microsoft galery doesn't have a feature to download old versions? It's available directly here: https://www.red-gate.com/products/old-versions#dotnet. Very weird. 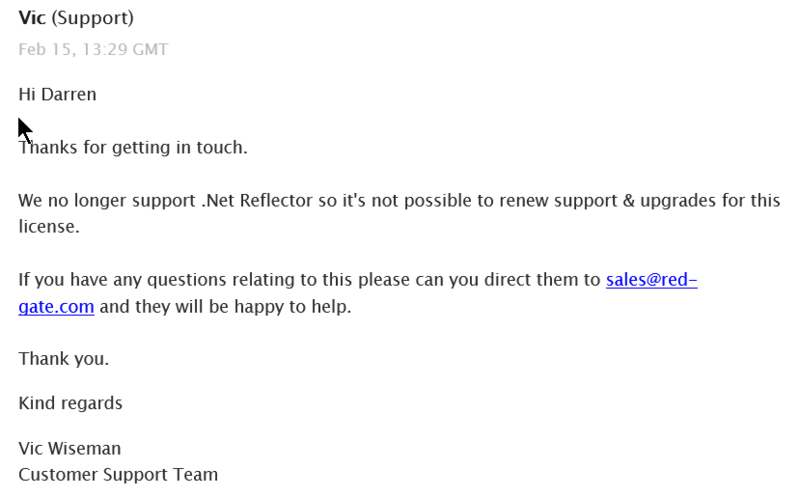 Just tried to renew my expired support contract and am told that Reflector is no longer supported and I cannot. Buyer beware. No support = no sale. I suspect there's something lost in the process there then as we do support it. Shopping cart also says there is no support. Ok I've never seen that before - if you get in touch with Sales you'll be able to renew your licence. Thanks Russell. That's is what I did. We'll see what they say. What is the upgrade price for someone who's been a paid Reflector subscriber from early on after RedGate acquired Reflector ? Hm... the FAQ ( https://www.red-gate.com/products/faq ) says "We don't sell support & upgrade packages for a few of our products, in particular .NET Reflector, our MySQL tools, and our free tools." The VSIX Extension for Visual Studio 2017 does not appear for .NET Reflector 10.x through the Visual Studio Gallery. Can I download a standalone VSIX directly from Redgate? UPDATE: Found this link from another thread for anyone looking for this who can't find it in the gallery. 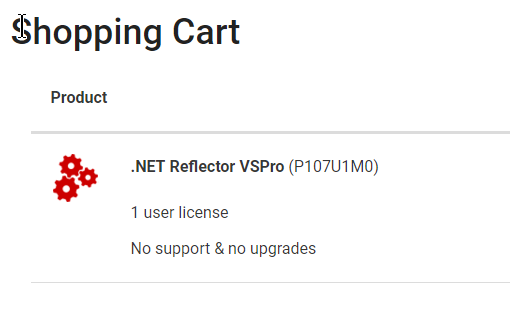 I've paid for reflector in the past, still find it useful, and could be interested in upgrading, but I find that I'm mightily put off by redgate's ambivalence towards the product. It really feels like the Cinderella of the product range. Before I shell out, I want to know what I can expect in terms of support and possible future upgrades. I'd like to have some sign that I'm not just throwing the money away. @DJ Doena thanks for the extra information - I've added this to the case and bumped the priority. @saffy If you want a direct answer to that you're probably best off emailing/phoning Sales, I don't know that they frequent the forums and its not something I can help with. For the licence question, in fact when Red-Gate acquired the .NET Reflector tool. They started charging for it and they told that It was a single buy with free upgrade. That's why nobody has an upgrade and support for it, it's not available for Reflector. But now it's look like they changed this and It will require a support and upgrades. So I've been in touch with the Sales department today and thought it would be worth passing on what I've learnt about pricing and the support & upgrades situation for version 10. Firstly, a 75% discount is available for people upgrading to version 10 from a previous version. Contact sales for a quote. Secondly, entitlement to upgrades. I'm just going to quote exactly what I got by email: ‘They are entitled to minor upgrades so for example if we release 10.1 with bug fixes customer is referring to then they can get that minor version but they cannot claim support on it. But if we release major version say version 11 then we as a company have not decided what is going to happen. May be they have to buy it with 75% discount like how they bought version 10?’ Thirdly, support. Again, to quote directly: "if they have issues with anything they can report the bug but we cannot guarantee a fix for any version of Reflector." Hope that helps makes things clearer. "You have paid for the license itself and you are entitled to use it indefinitely but as we no longer support .Net Reflector you will need to post your technical question on the forum." So I really don't understand how something can be sold with a bug and then get told it isn't supported. Especially when it was released 1 month ago. @Russell D Do you have a view on this? I suspect that you're seeing a bug that we're currently investigating, but its hard to say without seeing the reproduction. Regarding your support it looks like you bought the product without a support contract which is probably why you received that - but I agree that if you are hitting a bug we should be taking a look at it so feel free to email in a repro and mention that I asked you to.